This may sound like a fiction story but it is true! While total world resources of oil shale are conservatively estimated at 2.6 trillion barrels, US sits on close to two trillion barrels of crude. Possibly more than all the crude than was ever produced worldwide since petroleum age began. 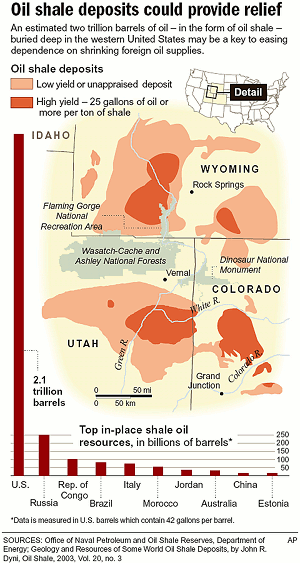 The Green River Shale Formation encompassing the States of Colorado, Utah and Wyoming was first discovered in 1924. This famous shale formation covers tens of thousands of square miles. It is found in three different ancient lake basins. The layers of sediment in this formation stretch undisturbed for many miles. This shale is a soft sedimentary rock that readily fractures into layers, composed of minute particles of clay, which may easily be removed. It was formed from multi layers through erosion. There are 40 million layers in one part of this formation. Deposits within these layers are fossilized plant, animal life and algae, which has turned over millions of years into kerogen. Some claims have been made that this was formed from the Great Flood of Biblical times. Geologists say that this formation was formed through countless floods perhaps through 500 to 700 millions of years. There are two conventional approaches to oil shale processing. In one, the shale is fractured and heated to obtain gases and liquids by wells. The second is by mining, transporting, and heating the shale to about 450oC, adding hydrogen to the resulting product, and disposing of and stabilizing the waste. Both processes use considerable water. The total energy and water requirements together with environmental and monetary costs have so far made production uneconomic. During the oil crisis of the 1970's, major oil companies spent several billion dollars in various unsuccessful attempts to commercially extract shale oil. After initial attempts proved to be too expensive and were shelved some ten years ago, a host of energy companies are revisiting technologies to successfully extract kerogen from shale and economically turn it into crude oil. Participating giant Shell Oil representative, Terry O'Cannon states, "We try to keep them from speculating too much and keep expectations low because we don't know if this technology will be successful and viable in the long term."